Today’s plan was to walk from Moore to the B&Q in Warrington where I planned to buy a 3.5mm steel drill bit so I could install the rear door catches on Waiouru. It was only a 16km round trip and I must be getting old because the middle of the ball of my right foot was starting to ache by the time I reached the B&Q store. 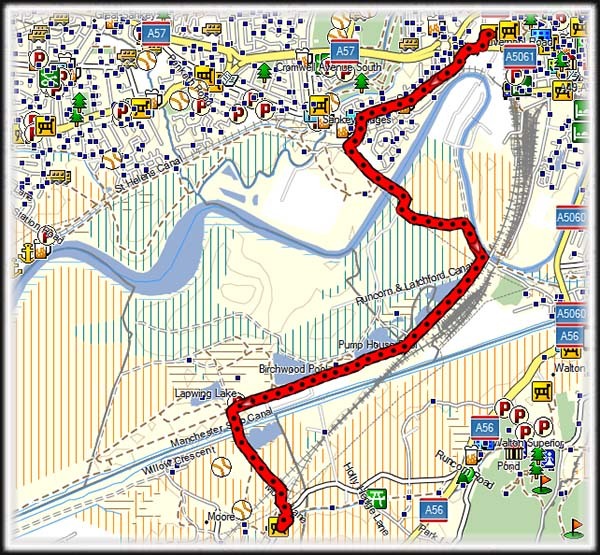 The route required me to cross four railway lines. Two were electrified and two not. I also crossed the Manchester Ship Canal and the River Weaver. 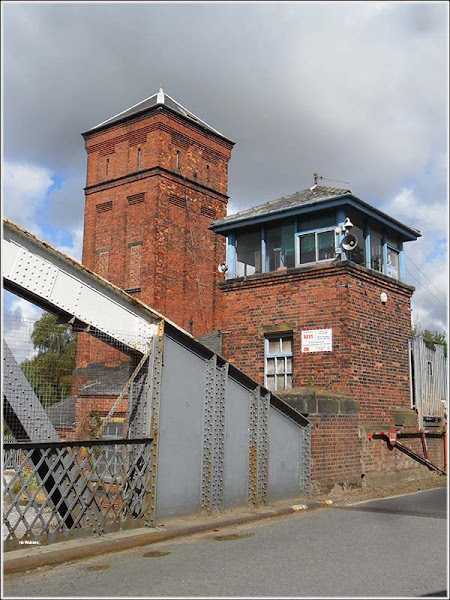 When I reached the Manchester Ship Canal my eyes were drawn to the brick tower at the far end of the bridge. 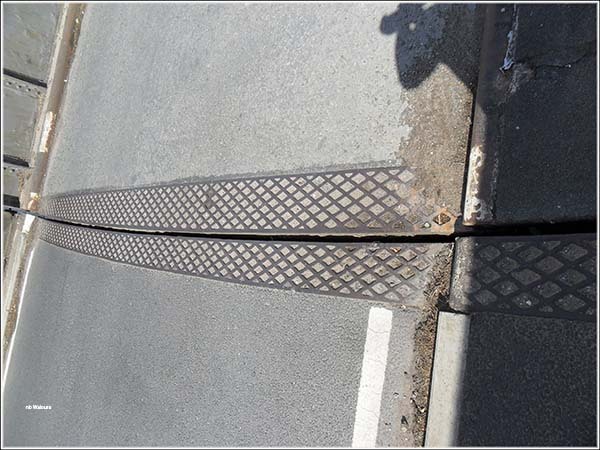 Then I noticed the curved joint in the roadway. That’s when I realized it was a swing bridge and the tower probably contained the mechanism to move the bridge. Or maybe it did many years ago. My assumption is it’s now electrified although the following website http://www.movablebridges.org.uk/BridgePage.asp?BridgeNumber=160 describes it as hydraulically operated. But something must drive the hydraulics? 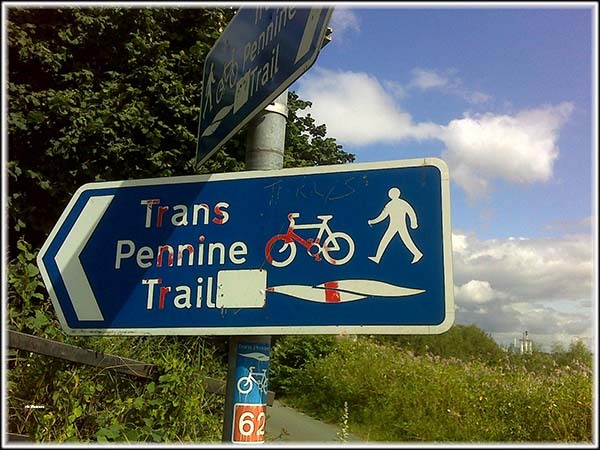 Part of the route took me along the Trans Pennine Trail. I’m not completely daft and I had checked that B&Q had the drill bits in stock. But when I reached the store I discovered someone had beaten me to the last of the 3.5mm drill bits. The walk was interesting but the reason for doing it was unfulfilled. Back at Waiouru (complete with sore foot) I decided to throw caution to the wind and attempt to thread at 3.2mm hole instead of the planned 3.5mm. 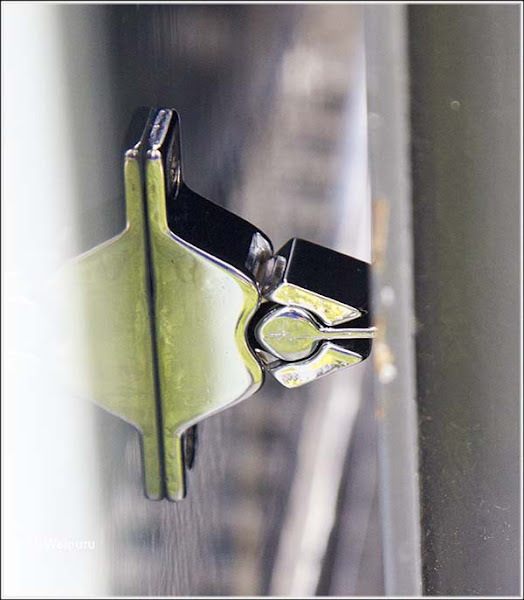 Blog reader David had left a comment on yesterday’s post suggesting a 3.2mm hole could be threaded. I know it can be done but I was reluctant to attempt threading a 3.2mm hole as I only have one M4 Tap and they are harder to find than 3.5mm drill bits. 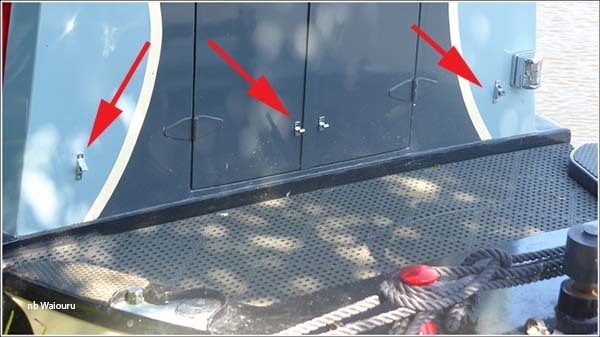 My method was to temporarily located the catches with duct tape ensuring they wouldn’t foul anything on the stern deck. I also decided to locate them just above deck level. That way it’s unlikely a trouser pocket will catch on the latch when boarding or alighting. Once I was happy with the location I applied a strip of masking tape where the catches would go and then marked the location of the screw holes on the tape. Then I used a hammer and punch to give the drill bit a starting point. The pilot hole was 2mm and then expanded to 3.2mm. When I first attempted to thread the holes with the Tap and battery drill the tap would jam. To overcome this I carefully applied a small amount of vaseline jelly to the threads of the Tap. Working very slowly I managed to thread all eight holes. The male and female halves of the two catches were then secured to the stern bulkhead with M4 stainless steel screws. I don’t want the threaded holes to rust so I then removed each screw in turn and dipped it in construction adhesive before screwing it back into the hole. The construction adhesive should reduce the possibility of rust occurring. I’m quite pleased with the catches. The weight of the door means they lock together and pull apart easily, but the catch does hold the door when it’s open. Another tip I picked up from the guys at the boatyard was to hang a used tube of adhesive vertically with a bead of adhesive sticking out the end. 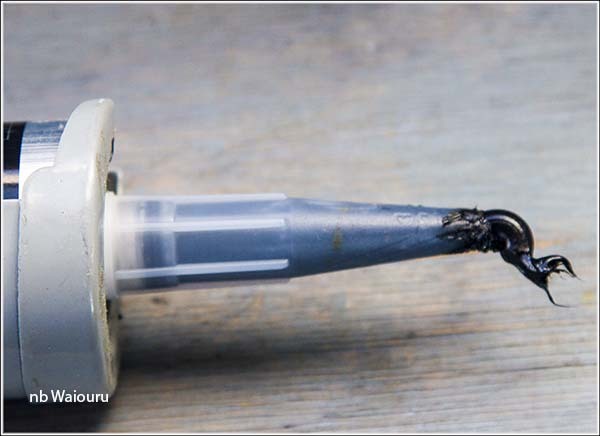 Next time you want to use the adhesive you should only have to pull the bead off the end of the nozzle for the adhesive to flow. There was just enough time left in the afternoon to go down into the garden shed and do a 250 hour service on the noisy green thing! A small correction-you would have walked over the River Mersey as opposed to the River Weaver!! Hope all is well-I live very close to where you are at present unfortunately though I am down on the Stratford at present! Richard beat you to the correction :-) I can't believe that ditch was the Mersey! The walk was only 16km. I'm just annoyed B&Q didn't have the drill bit! A general rule of thumb - tapping drill size=tap size-thread pitch. Thus M4x.7 would need a 3.3mm drill, M5x.8, 4.2, M6x1, 5mm. And I've been beaten to it re your waterway identification... How's the feet? It is quite incredible that in the space of 15 miles or so that the Mersey spreads out into such a massive river-largley because of the tidal element coming in from the Irish Sea. Handy tip re the adhesive, but when you say 'hang ... vertically' do you mean with the nozzle pointing downwards or upwards? Good question. The tube should be suspended vertically with the tip of the nozzle at the lowest point. The bridge tower is probably just a water tower, storing water at a height to give the pressure to open the bridge. You can spend hours with a small, low pressure pump raising water to be stored at the top of the tower, then release all the water into hydraulic rams to provide high pressure to open and close the bridge in a short time. The mechanism would be little more than valves to be open and closed to feed the water into the rams, and a person to manually operate the valves in the correct sequence. If you look at other locations around Merseyside, such as Hamilton Square railway station in Birkenhead, you can see similar towers which once held water to power the lifts. 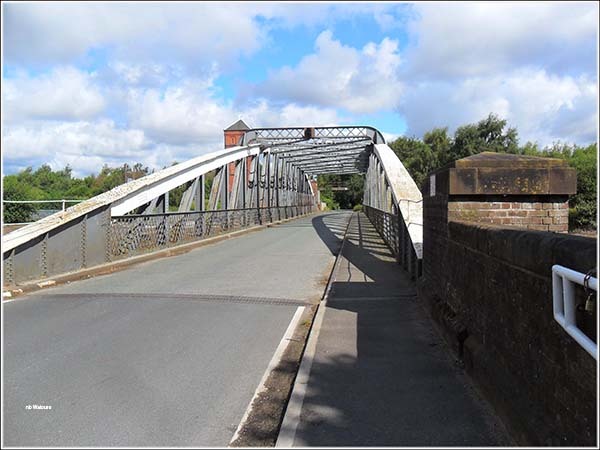 I grew up in Stockton Heath and was told that the Ship Canal swing-bridge there was powered by the head of water from the nearby Latchford Locks. Lazy Day… well not quite!